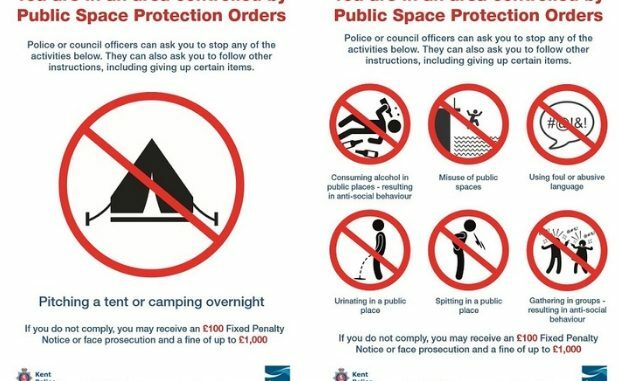 No fixed penalty notices have been issued to date under the Public Space Protection Orders (PSPOs) brought in to combat antisocial behaviour in Margate and Ramsgate. The orders were passed by Thanet council in July after hundreds of complaints and enforcement action against people spitting, urinating and defecating in public areas as well as jumping between buildings. They cover Margate Central and Central Harbour in Ramsgate and parts of Eastcliff in Ramsgate and Cliftonville West. But a report to councillors says progress has been slow following delays in implementing the orders due to a lack of officers, lateness of training and sign installations and policy which prohibits police officers or PCSOs from issuing fixed penalty notices to any person under the age of 18. A report to the community safety committee, due to meet on January 31, says: “To date there have been no fixed penalty notices issued for breaches of this PSPO. Policy within Kent Police prohibits police officers or PCSOs from issuing fixed penalty notices to any person under the age of 18. “Thanet council Community Safety Unit take an incremental approach to enforcement meaning other options prior to issue of an FPN for breach of PSPO are explored in the first instance. Thanet council have procedures in place to issue penalty notices on behalf of police/PCSOs. “However as the establishment of the CSU comprises of three officers and one manager there is future potential risk for a significant abstraction from core duties so this aspect will require regular review. The effectiveness of the orders will be examined again in March and then September. The PSPOs prohibit congregating as part of a group of 2 or more for such duration as specified, when directed not to do so by an authorised officer; on the basis that the behaviour is causing or is likely to cause, harassment, alarm or distress to others in the locality. They also prohibit misusing any public space which is likely to cause, harassment, alarm or distress to others and includes a ban on foul or abusive language that it is likely to cause distress and urinating, defecating or spitting in any public place. During the 2017/18 financial year tactics to combat antisocial behaviour included a large number of police dispersals, the application for three civil injunctions, two Criminal Behaviour Orders, 36 Community Protection Warnings and 8 Community Protection Notices. Thanet District Council’s Community Safety Team dealt with 239 complaints of ASB within the designated areas and took enforcement action for the misuse of public space on 23 occasions. Thanks to police cuts by the Conservatives all we have now is a flashing blue light service where police have to dash from one call to the next. It’s not until after a crime has been committed that we might just might see a police officer. Yet TDC finds time trying to fine people for supposedly spitting. That falls in to this category. What was the point in adding these PSPO’s to the list of other measures to be taken, it just confuses the officers, then having to look through which procedures to take first so not to be too harsh. Then not having the officers to handle any instances doesn’t help, other than the private Kingdom police, who only deal with spitting, cigarettes dropping and accidently dropped pieces of paper. In other words, a waste of public money! It’s all good and well inventing new ways to fine the public when they are going about their business, but this is just pathetic and leaves the door open to further accusations of corruption. What an absolute joke. Someone probably got paid good money (our money) for this. Given the disgusting, numerous piles of human faeces left laying around whenever our traveller friends visit the car parks down Ramsgate seafront they could do a lot worse than pay them the occasional visit.